If you asked your average turkey hunter what he was doing to prepare for next spring, he would probably tell you that he was brushing up on his calling or tricking out his new shotgun. These are things that every turkey fanatic knows are crucial to being successful, but are there more important factors? It seems more and more hunters are losing sight of the major aspects of successfully harvesting spring gobblers. A couple of the MOST important and often over looked aspects are hen nesting habitat management and brood rearing habitat management. It may seem irrelevant, but when gobbles are ringing out from all corners of your property on opening morning, you’ll be glad you considered the big picture. Catering to the needs of the hens in your area can be a surefire measure towards being consistently successful at harvesting gobblers in the spring. The main reason any hunter finds themselves propped against an oak tree staring down an evil ol gobbler, is only because that bird has reason to believe there is a receptive hen in the area. This may be induced by calling or decoying, but the big picture dictates otherwise. Gobblers want hens; so accordingly, they will only be where the hens are. As with any animal, reproducing is what drives them. The gobbler seeks to breed and the hen’s maternal instinct is to be in the most ideal location to successfully nest and raise her young brood. With this said, it seems imperative that prepping a property for good turkey hunting should be focused on the hens and their nesting and brood-rearing habitat. Hens can’t be successful at nesting unless they are in a safe place to do so. A hen must be concealed due to her extreme vulnerability on the ground nesting. A hen will find a suitable place with high vegetation or cover for her nest site. Hens need a nesting area that keeps them out of sight of predators while they are sitting on the ground. Leaving old growth fields or encouraging new growth would be ideal. Nesting sites also have to be prepared in advance for the hen’s soon-to-be brood. Poults are extremely vulnerable to predation once hatched and must be in a convenient location near a food source where food can be quickly and easily obtained. The shorter the distance a hen has to travel with her poults, the fewer she will lose in the long-run. Creating nesting habitat near food sources will help increase poult success. A poults diet mainly consists of insects. Leaving openings in their natural state or making new openings with insect harboring vegetation gives plenty of areas for a hen’s poults to bug. The closer the desired nesting area is to these openings, the safer it will be for the hen to traverse with her young. You may also look into increasing brood feeding areas and providing safe bugging areas in which a hen can see where danger may be and her poults can be concealed. All these factors are usually done naturally, but there are things you can control that can help the process. Planting native grasses common to a hen’s natural nesting habitat in your area can increase the overall number of hens nesting on your property. Also, encouraging natural growth and leaving fields untouched can help increase nesting opportunities while those same areas will provide insect habitat so that young poults may feed there. Most hunters don’t think of these factors when preparing for the upcoming season. 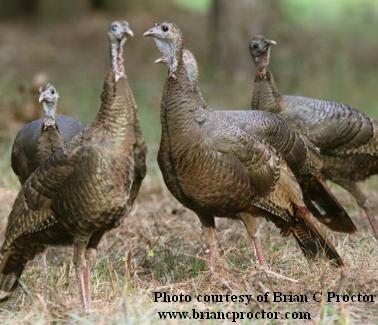 They are true biological ways to draw and hold gobblers throughout the spring season. So, before you start dusting off your vest or looking for a new load to pattern this year, stop and think about the big picture. Remember, those gobblers didn’t arrive on your property because they knew there was a sharp looking 12 gauge or a new-found master of the box call lying in wait. They came because the hens did.